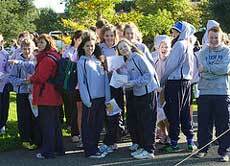 Leinster Schools Orienteering hold orienteering events for all Leinster schools throughout the school year. We look after all the planning and organising, we have all the orienteering equipment and electronic timing system and all you have to do is enter and come along. We have courses for both boys and girls, 5th Class primary right up to 6th Year post primary. Our courses are of an easy standard, with the focus on providing an introduction to orienteering for the students (and perhaps their teachers..). Orienteering is now on the curriculum for primary and post primary school students and is an inexpensive adventure sport option for schools to provide for their students. However, this can involve a lot of extra work, equipment and organisation for teachers, which may not always be feasible. To facilitate teachers in giving students the full experience of orienteering, we run a series of orienteering events through the school year for all schools in Leinster to enter. Events can be entered just as a once-off or as part of a league. Almost all the competitors are new or novices to the sport of Orienteering. So all courses are easy-to-very easy, to cater for their capabilities and inexperience. There are 4 events each year for primary and 4 for post primary, 3 of which you can combine for the league and a Leinster Schools Orienteering Championships at the end of the year. Any of the league events can be entered by you as just a once-off event. All these events are held in parks and forests around Dublin/Kildare/Wicklow, which have been selected for their small size, path network and uncomplicated terrain. Costs are kept to an absolute minimum, to keep the activity viable for schools and parents. 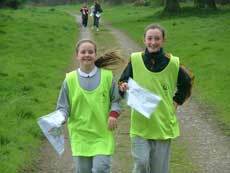 We have been running these schools events since 2007 and many schools have expressed their satisfaction with our high standards of orienteering and organisation. We are a member of the Irish Orienteering Schools Group (IOSG), which is affiliated to the Irish Orienteering Association (IOA). We are all active orienteers and members of orienteering clubs such as GEN (Great Eastern Navigators), a southeast-Dublin based orienteering club. The main Planner/Organiser, Mary, has been manager of the Irish Junior Squad and travelled extensively with them throughout Europe to international competitions. She has also Planned, Controlled and Organised many competitions for all ages, including adult Championship events. Our team of volunteers are all also regular club orienteers, with much international experience. Also, many of us have completed First Aid courses, given by members of Dublin & Wicklow Mountain Rescue. If you are interested in coming to an event, we'd love to hear from you. Just contact us and we'll take it from there.